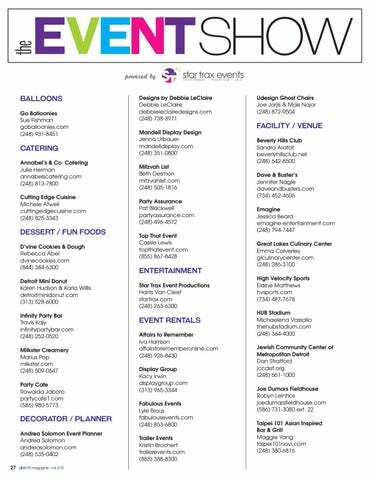 BOOK YOUR CORPORATE EVENT TODAY! the best events have the best desserts. What are you serving? Hiring a sweet treat vendor to create something fantastic and fun on-site won’t be forgotten. We have gathered the best local treat providers to make your search for the finest options easy. If you are having something from this fine list – I’ll be there! Karen Hudson / (313) 528-6000 / detroitminidonut.com Made on the spot, our HOT, FRESH DONUTS are always a hit. Sprinkled with cinnamon sugar (or the topping of your choice), they are bite-sized and will melt in your mouth. The delicious smell will entice your guests to seek out the donut station. Donuts can be enjoyed on the way in, during your event, or on the way home - no one ever passes on fresh donuts. Rebecca Abel / (844) 384-6300 / dvinecookies.com Our ingredients are everything. Let us create for you the most beautiful cookie display, ice cream cookie sandwiches, edible cookie dough bar, cookie dough cups, and more. We offer traditional baked snacks along with gluten-free and vegan options. Inside your event or outside from our food truck - the possibilities are endless! Made with the finest local Michigan cream, our liquid nitrogen ice cream will be an experience no one will forget. Many delicious flavors to choose from, including: rich truffle chocolate, salted caramel, cookies & cream, natural ground coffee, and many more! Flavored syringes and popular “Dragon’s Breath” are additional options to enhance the experience. 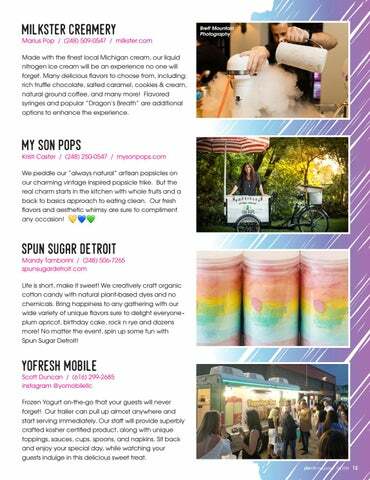 Kristi Caster / (248) 250-0547 / mysonpops.com We peddle our “always natural” artisan popsicles on our charming vintage inspired popsicle trike. But the real charm starts in the kitchen with whole fruits and a back to basics approach to eating clean. Our fresh flavors and aesthetic whimsy are sure to compliment any occasion! Mandy Tamborini / (248) 506-7265 spunsugardetroit.com Life is short, make it sweet! We creatively craft organic cotton candy with natural plant-based dyes and no chemicals. Bring happiness to any gathering with our wide variety of unique flavors sure to delight everyone plum apricot, birthday cake, rock n rye and dozens more! 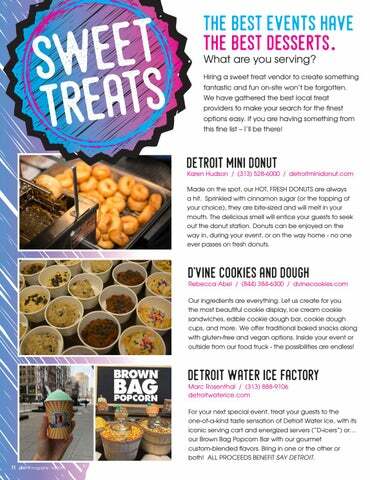 No matter the event, spin up some fun with Spun Sugar Detroit! The greatest interactive entertainers in the country! Is it a big statement? Yes. And we are prepared to back it up! The fun starts here. Star Trax MCs, DJs and Dancers are unlike any other. These amazing entertainers care about every detail of your event and bring the magic to every moment. We provide exceptional experiences that you and your guests will remember forever. Our customer service canâ&#x20AC;&#x2122;t be beat. We create the magic - one event at a time. Weâ&#x20AC;&#x2122;re with you every step of the way. 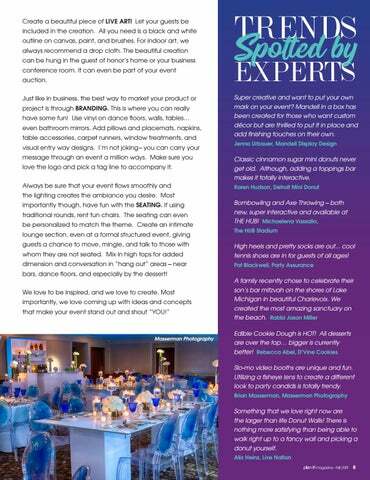 The Advisory Team, a consulting service available to Star Trax clients, is designed to assist in the planning, production and management of your special event. Like any other complex project, creating a great event requires leadership and experience and no other event consulting company has better people or more exposure to events. The greatest interactive entertainers in the country! The fun starts here. Star Trax MCs, DJs and Dancers are unlike any other. 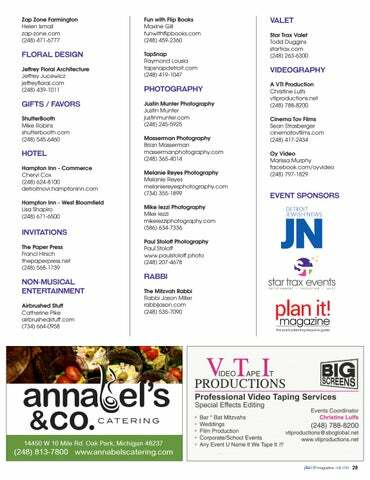 These amazing entertainers care about every detail of your event and bring the magic to every moment. We provide exceptional experiences that you and your guests will remember forever. A private valet experience Star Trax prides itself on unmatched customer service and satisfaction. With a staff of over 300 valet parkers, we have the ability to handle nearly any size valet job with ease. Forgot your phone in your car? No problem. Need help unloading? Happy to get it for you. Do you require a little extra assistance? Just let us know. Fully bonded and insured, a Star Trax valet experience is quite simply – AWESOME! The little things make a BIG difference It is all about the fun – and we have plenty of it. With over 75 different activity choices, we are chock-full of extra fun. Fully staffed and managed, we are always ready to go. It’s not all fun and games… oh wait, yes it is. 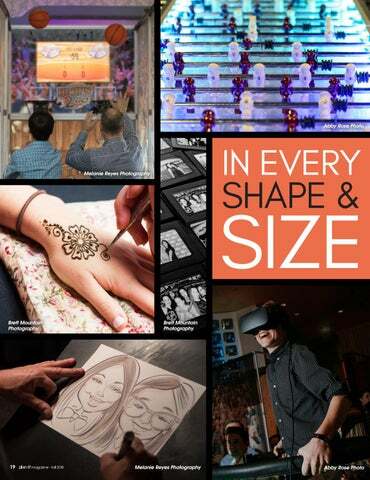 Our arsenal includes multiple photo products, interactive takeaways, games, body art, custom clothing, crafts, entertainment, and so much more. Plan an event at the only venue where culinary chops, craft beverages and epic gaming all come together for one unforgettable party. The James Beard Award Winning Chef Hugh Acheson diner-inspired dishes are amazing. And with bowling, ping pong, darts, an 80’s arcade, foosball, two private karaoke rooms, deck shuffle, a photo booth and a ton of table games, Punch Bowl Social is one of the only places where you can come as a guest and leave as a legend. MOBILE Party SOLUTIONS e often come across “the perfect venue” for an event … only to later find out that the site lacks kitchen space and sufficient resources needed for catering. While we are always able to find warmers, utility racks, and other basic catering essentials, we could never find a fullyequipped, rentable kitchen. Until we met Kristin Brochert, owner of Trailer Events. 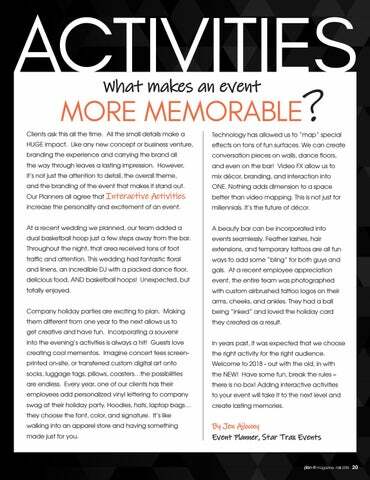 Trailer Events has made it possible for us to bypass what could have been a major event restriction or venue deal breaker and turn the space into a state-of-theart facility. Originally in the restoration business, Kristin offered a solution for anyone planning a renovation project or an emergency situation that required immediate restoration: a mobile kitchen. Her clients were mostly schools, summer camps, and nursing homes. Word got around about these mobile units and it soon became obvious that the private events world could also utilize her brilliant idea of a mobile kitchen. Thus, Trailer Events was born. We had our solution to hosting events in fantastic venues with little or no kitchen space! Trailer Events offers a state-of-the-art commercial grade, NSF Approved, and fully licensed mobile kitchen. The kitchen has a functional floor plan design and includes the necessary equipment to prepare and serve food in a clean, safe, mobile environment. and the branding of the event that makes it stand out. increase the personality and excitement of an event. millennials. It’s the future of décor. dual basketball hoop just a few steps away from the bar. they created as a result. the right activity for the right audience. they choose the font, color, and signature. It’s like walking into an apparel store and having something made just for you. A client had decided on ice sculptures for centerpieces at her party. Days prior to the event, a storm came through Metro Detroit. Many lost power, including the ice sculpture company. Everything was destroyed. We made dozens of phone calls to help secure another company to fulfill the extensive order. Success – another company was found and happy to help. The Red Coat Ladies always go over seating assignments prior to the start of your event. Many times, we have caught 24 guests mistakenly assigned to the same table. With ease, we were able to solve the problem and guide 12 guests to the right spot... without bothering the hosts. On one recent occasion we were given the wrong event time. When the client called to find out our whereabouts – we dropped what we were doing and headed right over! She couldn’t have been more apologetic. The time had changed when a friend’s graduation party was conflicting. Now, we always ask for a copy of the invitation! We have literally seen it all. It’s easy to save the day when the party has no ice – but how about when the client forgets to hire a bartender, valet parking or something else that slipped through the cracks. Finding last minute tents are easy – but how about finding water vacuums on short notice. We haven’t just found them – we operated them too. Changing light bulbs, valet parking in the pouring rain, wiping spills... even removing our client’s hair extensions when they were noticeably becoming loose. You should NEVER feel uncomfortable asking a prospective vendor how they handle the unexpected. If they can’t ramble off a list of times that they were able to help, they may not be the best addition to your team. Vendors and event professionals get tested from time to time to see how well they work in crisis mode. When you work in any industry where you are “behind the scenes,” you are sometimes thrown for a loop and may have “fires to extinguish” – literally! In the event industry, however, the professionals that shine are the ones that throw themselves into the line of fire – usually addressing problems for which they are not even responsible. 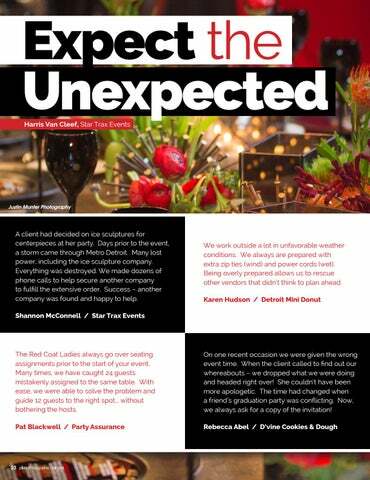 Expecting the unexpected is the job of every event professional; keep the ship moving and, most importantly, keep the hosts and guests happy! An Iconic Backdrop for Your Next Event From intimate meetings to extravagant galas, The Westin Book Cadillac is the ideal destination for your next event. With over 35,000 square feet of event space in 17 rooms, we offer countless ways to connect and celebrate in the heart of Detroit. VISIT BOOKCADILLACWESTIN.COM OR EMAIL EMILY.COOPER@WESTIN.COM FOR MORE INFORMATION. Â©2017 Starwood Hotels & Resorts Worldwide, Inc. All Rights Reserved. THE BROKER OF CHOICE FOR THOSE IN THE KNOW. 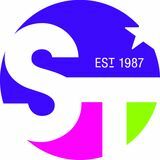 Over 50 vendors under one roof - The Event Show (powered by Star Trax) brings in the best of the best, who showcase their skills and talents for all your event planning needs. 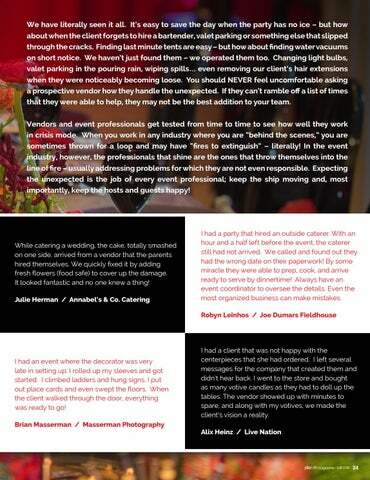 Vendors and event professionals get tested from time to time to see how well they work in crisis mode. We've reached out to a variety of local vendors and heard how they successfully handled the unexpected. All the small details can make a HUGE impact. 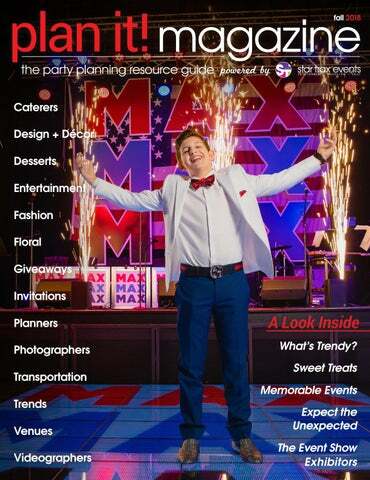 Our planners all agree that Interactive Activities increase the personality and excitement of an event. The best events have the best desserts! We have gathered the best local treat providers to make your search for the finest options easy. 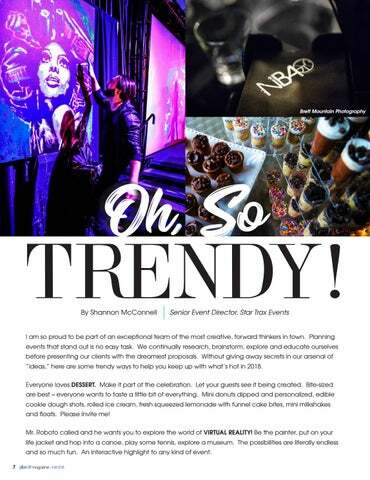 Top Trends of 2018 - Desserts, Virtual Reality, Live Art, Branding, Seating Options, and more!